This year we made a more cooked-down sauce than we have in previous years. The first sauce, the butter-onion, cooked down from a completely full five gallon pot to about half that, and less when we pulled out the chunks of onions. The second, the basil-garlic, cooked down to half from a full six gallon pot. It took a long time, but it was worth it. The sauce we made is amazing. 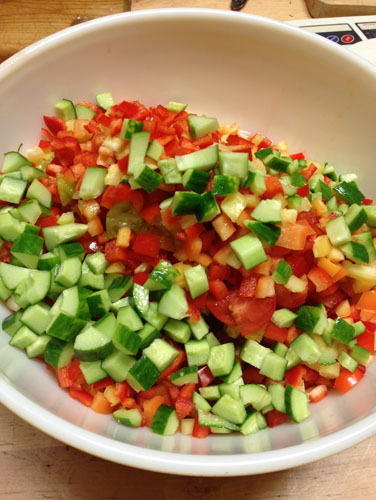 You hardly need any of it to give a punch of flavour, and it will really stand up to having meat added. The butter-onion sauce is nirvana. In previous years we've made a lighter sauce that still needed cooking when we used it, so this is an interesting contrast. 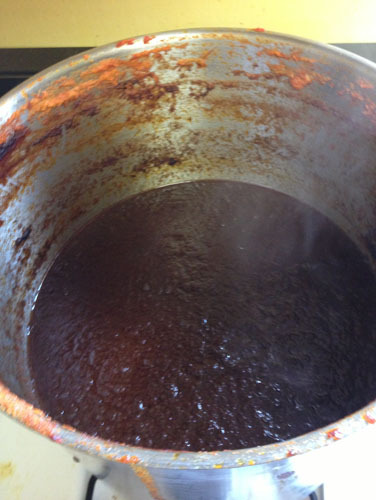 This sauce is great, but we have a different plan for next year, for a fresher sauce. It's nice to have both kinds. We cooked the butter-onion sauce from Saturday afternoon until Monday evening. 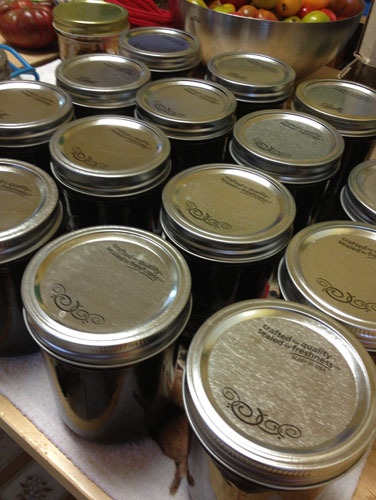 Several people asked me to go through the process of canning to show how it's done. It's really very very simple. 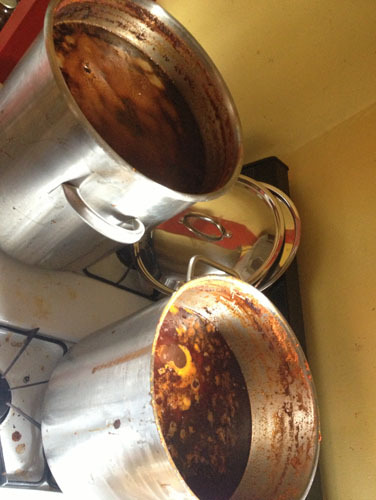 I think there are now a trillion web sites that talk about water bath canning (a trillion AND ONE). 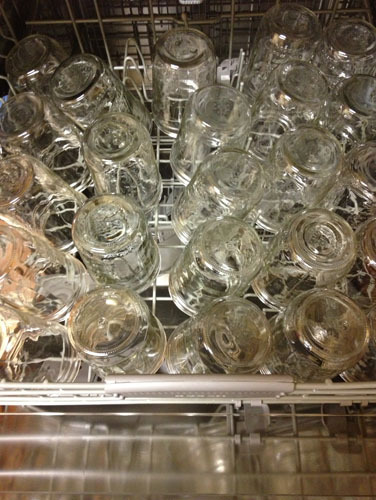 I start out by sterilizing the jars in the dishwasher. I do this because it's easy and washes them at the same time, which they need. Even brand new jars will have factory dirt on them, and the ones reused from previous years were washed before being stored, but god knows what happens to them in storage. Washing is critical. If you don't sterilize in the dishwasher, you need to wash them then sterilize them by putting them in your boiling canner for 10 minutes, open. I also wash the lids -- they are also dirty from the factory -- but I do it by hand so the seals aren't damaged. 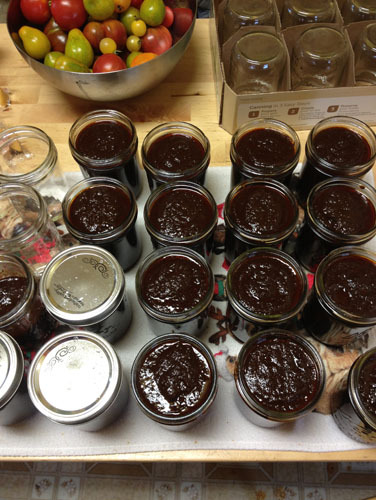 I set the sterilized jars out on a towel on the table, then fill them. I have a wide funnel that came with a canning set ages ago that makes it easy; over time you learn where on the funnel to fill to. For most things I fill to leave less than 1/2 inch of space at the top of the jar. Then we put the lids on -- those are softened up by soaking them (about 10 minutes) in a pot of water that was brought to nearly boiling then removed from the heat. When I'm in a rush or just out of room on the stove, I will sometimes just heat water in our electric kettle and pour it over the lids. 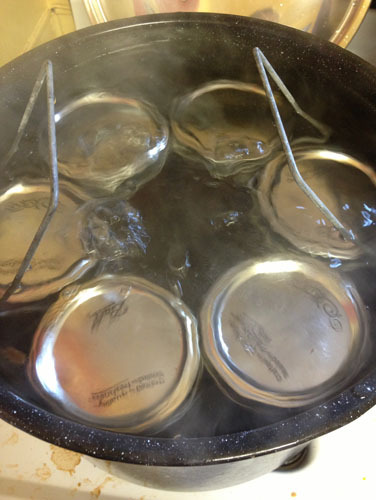 They don't need to be boiled -- this is basically just to heat up and soften the plastic seals on the lids. Then the water bath. It can take up to an hour for the water bath to get boiling, depending on how hot it is outside and how frugal you are trying to be with the gas. Six jars at a time (technically seven will fit but they are hard to get out) get lowered into the big canning pot. I process them for 15 minutes just to be certain they get a seal. Here at sea level we could in theory do only 10 minutes. I let them cool off on the counter after processing, then check the seals to see if they are good (no popping when pressed), and finally label them on the lid with a sharpie. I don't do paper labels any more because they are a pain to clean off. The sharpie on the lid stays with the jar as long as we need it and goes away when we don't. The garlic-basil sauce was more complex. It cooked until Wednesday, at which point we made the executive decision to remove the olive oil floating on top of the sauce (we saved that oil for some unknown future purpose) before jarring it. 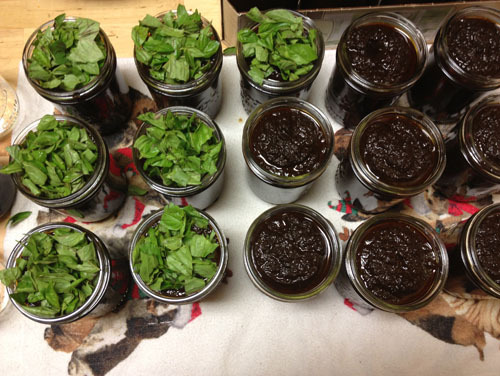 We added the basil right before canning, and to be sure each jar got the same amount, we did it on top of the sauce in the jar. 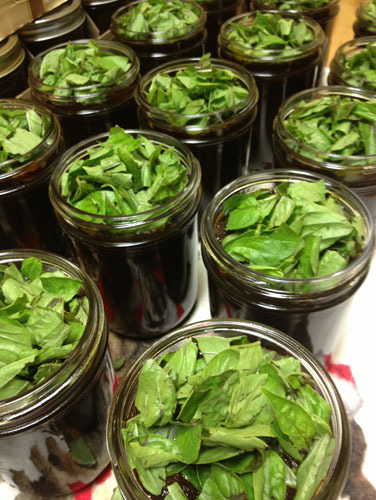 There is a certain fussiness to carefully measuring out basil into each jar, tucking and nudging it away from the edges (where it would interfere with the lid seal). After the lids were on, but right before they went in the water bath, I inverted each jar and mixed the basil with the rest of the sauce. After all that, we just wanted a little something light to eat. Our neighbors had brought us an enormous bag of garden produce. It seemed obvious: a nice fresh gazpacho. Many recipes call for it to be run through a blender into a smooth soup, but I like large chunks. Served with a quesadilla it is one of those perfect food combinations. How do you know if your dishwasher sterilizes? I have a Sanitize cycle, but the owner's manual waffles about how hot that gets. You took the onions (yum) out of the sauce? Is the entire lid (ring plus flat top) one use only, or just the flat top? If memory serves me correctly, jars in the pot of boiling water don't sit directly on the bottom of the pot? but on some rack thing? I can remember my mother sealing by pouring melted wax on top. I understand we should all be dead from that. I hope to actually can something once I get over my fear of botulism. I just use the sanitize cycle on the washing machine. At least in theory it gets hot enough (the heat is in part based on your water heater settings). I've never had a problem with it and I'm not producing food for other people. The wax is slightly terrifying. You can't tell if you have a good seal or not, and if not, you can't tell if the food is infected (it doesn't bulge or hiss). And it makes a godawful mess. I like the metal tops better. The only non-reusable part is the center metal circle with the plastic seal on it; the rings can be reused indefinitely, though I recycle them when they get dented up. And yes, the jars go in a metal rack (you can see it in my photo there) that lifts them up when you need them and lowers them down to not quite the bottom of the pot. If you just set them in the pot with no rack there is a huge risk of heat damage to the jars, which translates to exploded jar in the water bath. No fun. I have always thought about canning food but have never done it. Seems simple enough, who knows maybe I will give it a try. The sauces look delicious, I would love to try the butter-onion one. The butter-onion sauce is amazing. We started getting more into canning when it was clear that we have a lot of pantry space, but not much room in the freezer. Before that we made tomato sauce in smaller batches and froze it. The cans are more convenient to store, to be sure. Note: We're getting pummeled with spam comments, so I've turned off the ability to use any HTML or include any links for the time being. Email with any issues.